The present day Comann Camanachd Leòdhais was ushered into existence with a meeting in Gaelic Room in the now-demolished Nicolson Institute building on the evening of Thursday 7th Dcember 2006. The club was set up with the intention of bringing Senior Shinty to Lewis, Harris (and as stated in the constitution), Great Bernera for the first time. 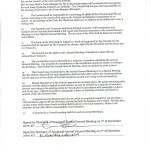 It was signed by the Chairman of the meeting, Eoghan Stewart, and the secretary, Micheal Macdonald. 1. The club shall be called Lewis Camanachd Club, and in Gaelic, as Comann Camanachd Leòdhais (henceforth known as the Club). 2. The object of the Club shall be to promote and foster the sport of shinty in Lewis, Harris and Great Bernera at Senior and Junior Level and to promote the use of the Gaelic language, especially in relation to the playing and coaching of shinty. 3. The membership fee will be decided at the Annual General Meeting. Applications for membership should be made to the committee through the Club secretary. There shall be four categories of membership. a) Ordinary Member, who shall have voting power. 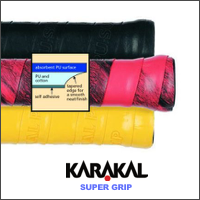 b) Playing Member, as well as Ordinary Subscription Membership. 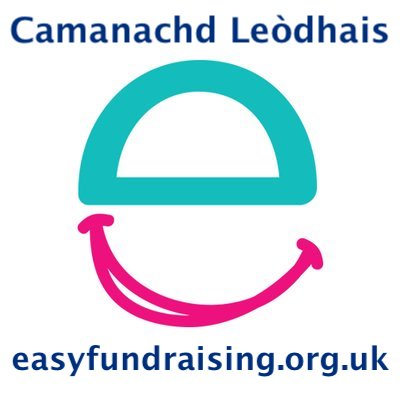 They will also be liable for the Camanachd Association membership fee, this enables them to compete in Camanachd Association competitions as well as qualifying them for insurance cover. c) Junior Member, under 14 at the date of the Annual General Meeting. Junior Membership of the above Club will be set by the committee, but will be no more than ten percent of the highest ordinary membership fee. They will not have voting power. Junior members will be liable for the Camanachd Association membership fee, this enables them to compete in Camanachd Association competitions as well as qualifying them for insurance cover. d) Honorary Membership. This may be granted to individuals per calendar year with the consent of the majority vote of attendants at the Annual General Meeting, excepting Special General Meetings. Such members shall have full voting power. 4. All persons who have paid the full annual subscription or are current members of the Monthly Draw at the time of the AGM or SGM, shal be eligible to vote at the Annual General Meeting or Special General Meeting. 5. The Annual General Meeting of the Club shall be held on a date close to the end of the playing season. In any case no later than sixty days after the official end of the Camanachd Association playing season, the date to be published no less than 14 days prior to the meeting. 6. The Office Bearers, who must be members of the Club, shall consist of Chieftain, President, Vice President, Secretary and Treasurer. The Chieftain and President shall be elected for a term of two consecutive years. Other office bearers shall retire annually. All shall be eligible for re-election. The same person may hold the offices of Secretary and Treasurer. 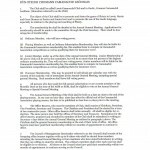 Nomination for the office bearers, proposed and seconded by members of the Club shall be submitted in writing to Secretary 7 days before the Annual General Meeting as outlined in paragraph 5 above. The Chieftain shall be granted honorary membership at the end of their term of office. All office bearers must have paid their membership within two months of appointment to continue in office. 7. The Council of Management (hereinafter referred to as the Council) shall consist of the foregoing office bearers together with up to 8 others who shall be elected from members attending the Annual General Meeting or from members who have stated beforehand, in writing, that they are willing to stand for election. The ordinary members shall retire each year but shall be eligible for re-election. All those on the Council must have paid their membership within two months of appointment to continue serving on the Council. 8. (a) Selected committee shall be elected by members at the Annual General Meeting. All members of the Club will be eligible to the said committee, subject to approval of the current council, at the next council meeting. (b) At every AGM a Team Manager for the forthcoming season will be elected plus the Captain for each team, if playing members are available. The Council will delegate full responsibility for the running of the team to the Team Manager/Managers. 9. The Council shall be responsible for conducting all affairs of the Club and shall fill any vacancy occurring in the course of the year in the Council and Selection Committees by co-option. At all meetings of the Club, the Chair shall have in addition to his/her deliberative vote, a casting vote. 10. The Secretary and Treasurer shall keep detailed accounts of all transactions and business of the Club and shall submit a full report and financial statement to the Annual General Meeting or at any Special General Meeting. The accounts of the Club be balanced and audited annually. 11. The funds of the Club shall be lodged in a bank and approved by the Council and the accounts shall be operated by the Treasurer by cheque, signed by the President and Secretary and/or Treasurer. 12. The Council has the right to call a Special Meeting of members to deal with any extraordinary business. 13. The constitution may be amended by a majority of members attending the Annual General Meeting. Any proposal for amendment to the constitution should be made in writing to the Secretary 7 days before the Annual General Meeting, dates as outlined in point 5 above. 14. 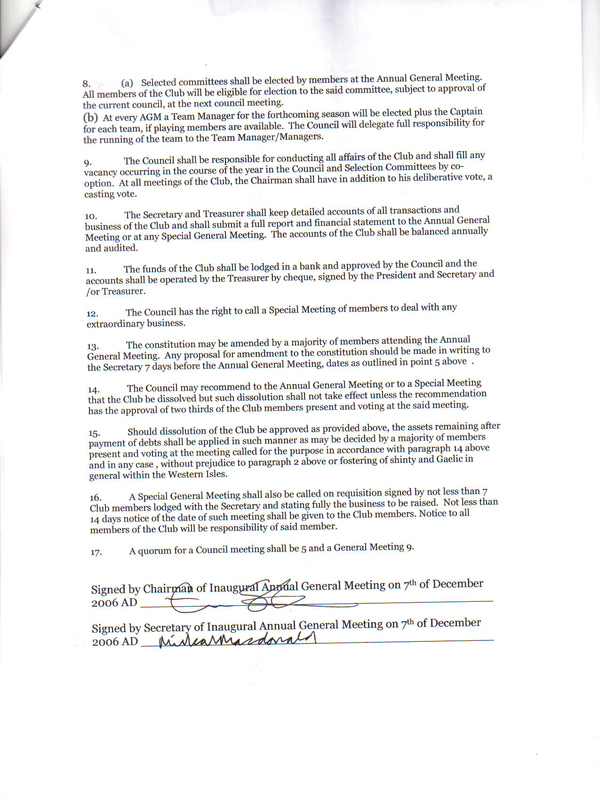 The Council may recommend to the Annual General Meeting or to a Special Meeting that the Club be dissolved but such dissolution shall not take effect unless the recommendation has the approval of two thirds of the Club members present and voting at the said meeting. 15. 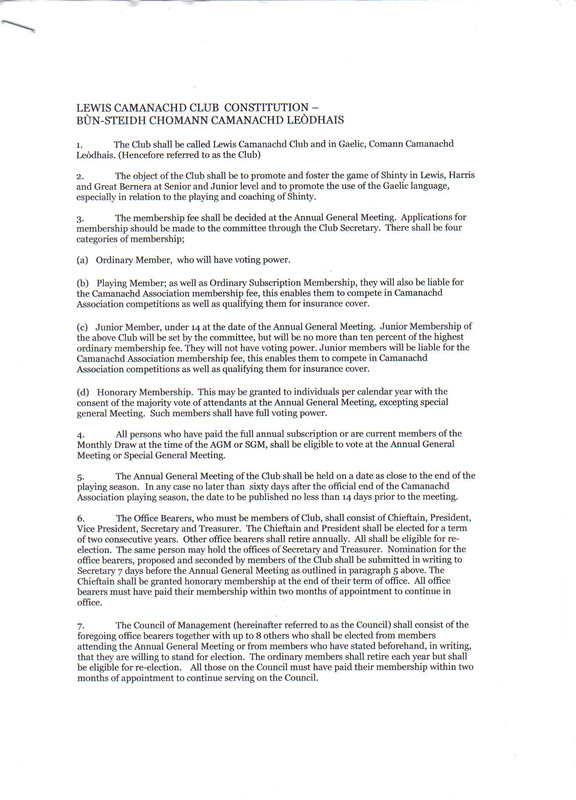 Should dissolution of the Club be approved as provided above, the assets remaining after payment of debts shall be applied in such manner as may be decided by a majority of members present and voting at the meeting called for the purpose in accordance with para14 above and in any case, without prejudice to paragraph 2 above or fostering of shinty and Gaelic in general within the Western Isles. 16. A Special General Meeting shall also be called on requisition signed by not less than 7 Club members lodged with the Secreatary and stating fully the business to be raised. Not less than 14 days’ notice of the date of such meeting shall be given to the Club members. Notice to all members of the Club will be responsibility of said member. 17. A quorum for a Council meeting shall be 5 and a General Meeting 9. The original documents can be seen in this gallery.